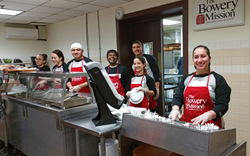 On 12 February 2016, at the Bowery Mission, the Esthetix Dental staff transformed into friendly and attentive cafeteria workers and served a tasty dinner to the Bowery Mission clientele. Help is doing something to aid or assist someone, Esthetix Dental Spa is committed to helping. It's why we're here. On the 12th of February with temperatures well below freezing, Dr. Arvind Philomin and the Esthetix Dental Spa staff jumped in taxis and headed down to the Bowery Mission, battling Manhattan traffic all the way. At the Bowery Mission, the dental staff transformed into friendly and attentive cafeteria workers and served a tasty dinner to the Bowery Mission clientele. “Help is doing something to aid or assist someone, Esthetix Dental Spa is committed to helping. It's why we're here” said Dr Philomin. Since being founded in 1879, the Bowery Mission strives to be the most effective provider of compassionate care and life transformation for people in need in New York City. This fits well with Dr. Arvind Philomin's support for the Marine Corps' Toys For Tots program and MGE Management with the Boys and Girls Club's Fight Against Illiteracy. About the Bowery Mission: it is a mission and men's shelter in the Bowery neighborhood of Manhattan. The Bowery Mission provides food, medical services and employment assistance to the working poor and homeless men women and children. At night The Bowery Mission opens its chapel to serve as a emergency shelter for homeless men. In addition to these services, The Bowery Mission offers a long-term (6-12 month) residential program providing homeless men the opportunity to rejoin society as working, contributing members. About Esthetix Dental Spa: Arvind Philomin, DDS uses state-of-the-art dental implant technology and equipment to provide exemplary care to every patient needing dental implants in the 10471 area and nearby. Patients at Esthetix Dental Spa can feel confident about the work being done and their new, beautiful smile. Patients living in Upper Manhattan, VWashington Heights, Riverdale and the Bronx should look to the only dental office offering the "teeth in a day" service, Esthetix Dental Spa.